"Unspeakable horrors from outer space paralyze the living and resurrect the dead!" Infamous director Ed Wood presents one of the goofiest B-movies ever made. When aliens invade Earth, humans struggle to survive attacks from the creatures and their deadly UFOs. Along with the attacks from the aliens, they use special powers to resurrect Hollywood stars from the dead. The mish-mash of aliens and zombies creates a campy film that has become a cult classic. 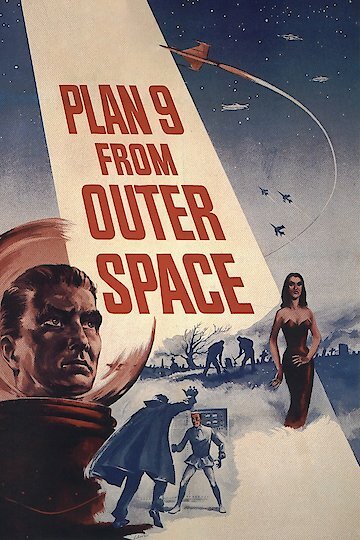 Also directed by Edward D. Wood Jr.
Plan 9 from Outer Space is currently available to watch free on Tubi TV and stream, download, buy on demand at Amazon Prime, Fandor, Amazon, Vudu, iTunes online.